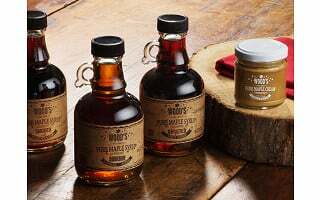 Traditionally made, but uniquely flavored, Wood’s specialty flavored maple syrup is like no maple syrup you’ve had before. 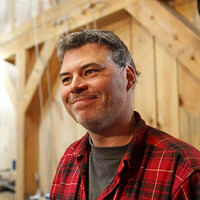 Maker Albee Wood makes the syrup the way it’s been made on his family’s farm for five generations, tapping more than 5,000 trees and boiling down the sap. Then he gets creative, even aging some of the syrup in bourbon or rum barrels. You can use this flavored maple syrup in so many new ways—in sauces, for baking, over ice cream, and even in cocktails. It’s packaged for gifting and perfect for anyone who loves to eat. In another innovative twist, Wood also makes a maple cream, whipping the syrup until the liquid is removed and the texture is like butter. It spreads like butter too, and won’t make pancakes—or anything else you spread it on—soggy. It will just make them delicious. Hello everyone! I'm proud to introduce Wood's Maple Syrup to The Grommet. I'd be happy to answer any questions you have! What is the shelf life of the maple syrup once opened? Lori the shelf life of the specialty syrups is 1 1/2 years. Where in VT is this made? My husband is from Bennington VT. We live in NC now but when we visit we always come home with VT maple syrup! We will definitely have to try yours with the maple cream! @SharonnWayne These are made in Randolph VT. We would love for you come by and visit if you are up in this area. Please do try some! Just wondering how many carbs are in the syrup and cream? There are 13g (4%) carbs per serving in an 8oz bottle of specialty syrup - 16 servings per bottle. There are 32 carbs (11%) per serving in the 4 oz cream - 4 servings per jar. @Al ....and what I really just think is amazaing... all I do is boil away water and what is left is an all natural sugar!! Calcium: 7% of the RDA. Potassium: 6% of the RDA. Iron: 7% of the RDA. Zinc: 28% of the RDA. 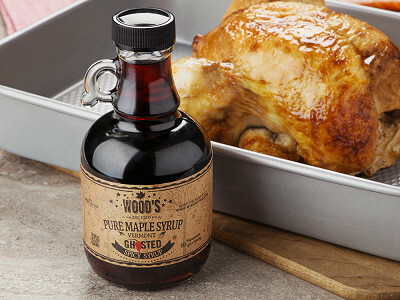 Anything produced by Woods Syrup is delicious and well worth the money. You can't have a better testimonial than that, Marjorie, thank you! Sounds delicious. Am I missing how many ounces in each bottle? 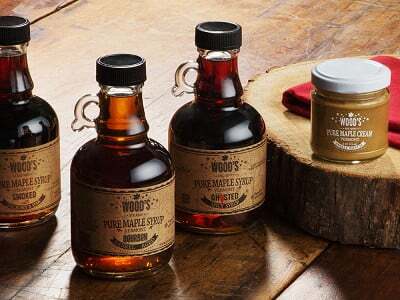 Traditionally made, but uniquely flavored, Wood’s specialty flavored maple syrup is like no maple syrup you’ve had before. 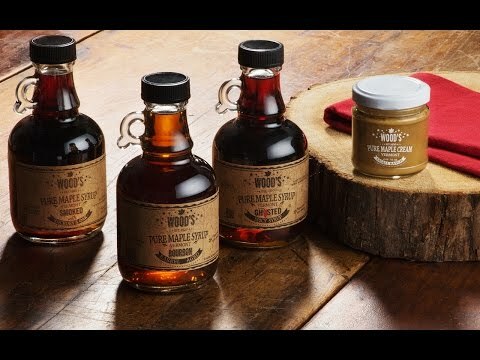 Maker Albee Wood makes the syrup the way it’s been made on his family’s farm for five generations, tapping more than 5,000 trees and boiling down the sap. Then he gets creative, even aging some of the syrup in bourbon or rum barrels. You can use this flavored maple syrup in so many new ways—in sauces, for baking, over ice cream, and even in cocktails. It’s packaged for gifting and perfect for anyone who loves to eat.